Embracing cutting-edge design and pushing the master weavers to their limits of what is possible and what’s not. Topas is the end product of some lengthy design work and many hours of trial and error. Not only did the colourings and textures of each rug have to be spot on, the weavers had a task of being able to hand-knot such fine works of art and in a time frame to make each rug affordable. 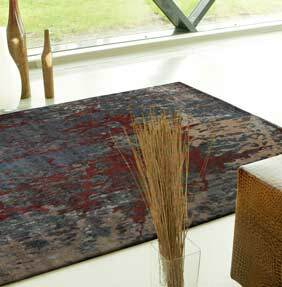 Topas really is a range of value when you consider the work that is put into each rug. Only the most experienced weavers will attempt to make a range of such grandeur. Topas, Topas Deluxe, Topaz Classic, Topas Modern Classic, Topaz Oxidised, Topas Oxidised Deluxe. All are handmade in India from a blend of wool and viscose. Made to measure bespoke sizes are available to order, the leed time is around 6 months.